Features an Intel 80303 64 bit RISC I/O OR latest processor. Supports up to 512MB of cache. Supports up to sixteen (16) 1" hot-swappable SAS/SATA drives. Redundant load sharing hot-swappable power supplies. High quality advanced cooling fans. Supports hot spare and automatic hot rebuild. Allows online capacity expansion within the enclosure. Local audible event notification alarm. Supports password protection and UPS connection. Built-in serial port interface for remote event notification. 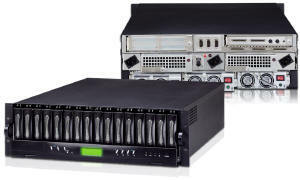 Dual host channels support clustering technology. The RAID subsystem is made by aluminum. Aluminum is an excellent thermal conductor and Aluminum offers a unique combination of light weight and high strength. Tagged command queuing for 255 commands, allows for overlapping data streams. Transparent data protection for all popular operating systems. Supports multiple array enclosures per host connection. Real time drive activity and status indicators. Automatic or manual failover: In addition to Automatic failover, System can be configured for manual failover mode. Automatic events-trigger: System administrators can specify script files that automatically starts in response to certain events. Automatic client connection: You do not need to notify or reconfigure the clients when an application has failed over to the peer server. Restart: Any failure that causes operation interrupts will first be resolved locally (e.g., restart on original server). Load balancing: Applications can be executed on either Server. Enable backup service on various platforms with JAVA support, like Windows 98/NT/2K/XP, Linux, AIX, Solaris, etc. JAVA GUI helps users easily backup/restore personal files. Users are not required to install proprietary programs. 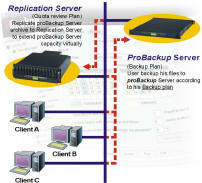 Task-oriented concept helps users to manage and track various backup/restore activities. Consolidate individuals' data of an organization to a central backup storage. Administrator has the privilege to restore every piece of information anywhere. Support high-speed Hard Drive backup / restore. Easy to extend the backup storage space. Easy GUI (Graphical User Interface) software manager, Interpretability in a heterogeneous enterprise environment. Plug and Play. Scalable storage systems. wide choices of drive vendors.